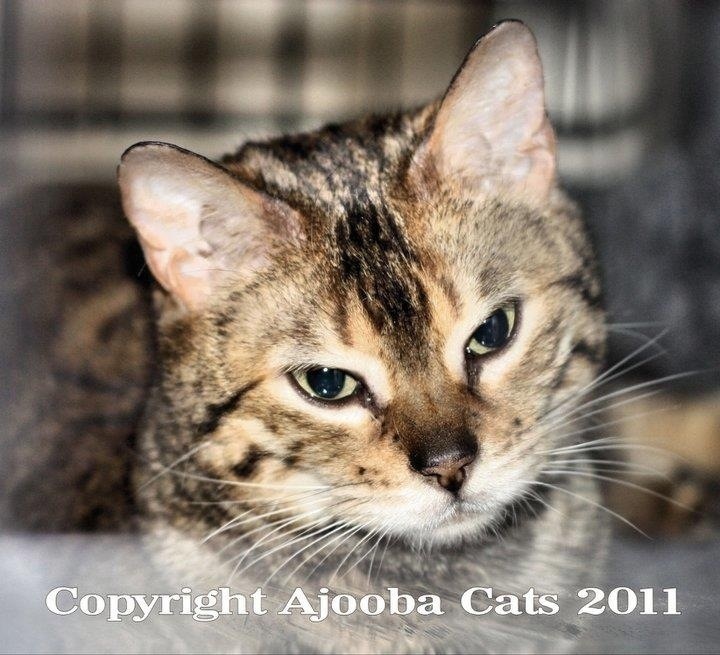 We fell in love with the Bengal cat in 2006 and spent time showing and breeding them. I cannot morally accept the lack of homes for cats everywhere and have decided it makes no sense for me to breed and “sell” animals. I will be finding suitable homes for some of our 17 cats, my price is unconditional love for a new family member with four paws and a fee for their rehoming which won’t come anywhere near what makes business sense to other Bengal breeders. This is Tinky, who was the first kitten we booked. She is a gorgeous 6 year old brown marble girl who will stay with us forever. Tinky is a Quadruple Grand Champion Alter and also a Premier with the GCCF. This is Nugget our handsome brown spotted Bengal boy. Nugget retired from being an adept stud boy and learnt the show ropes with us. We had a great time showing him. Nugget is a Supreme Grand Champion Alter. 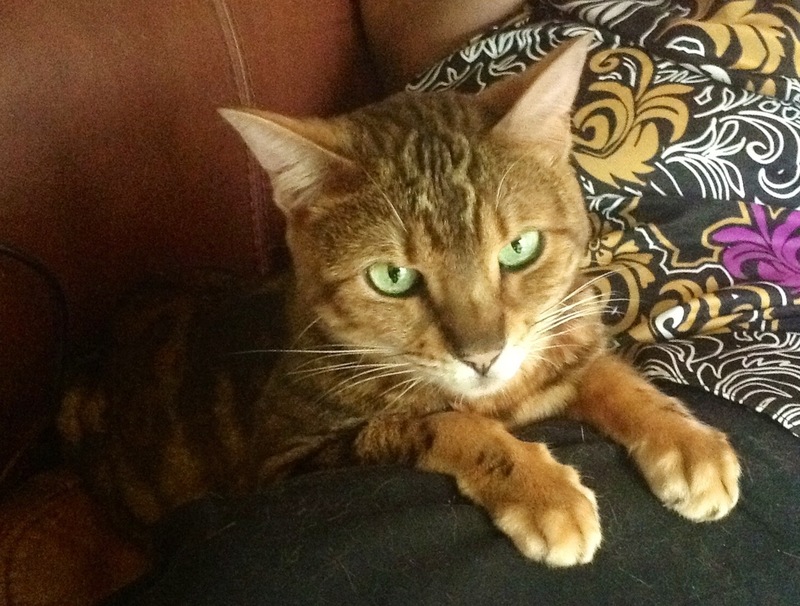 This is Rosie, one of our early breeding girls, she is a brown spotted/rosetted bengal and she remains with us as a much loved pet. Rosie has given us cracking and naughty kittens. 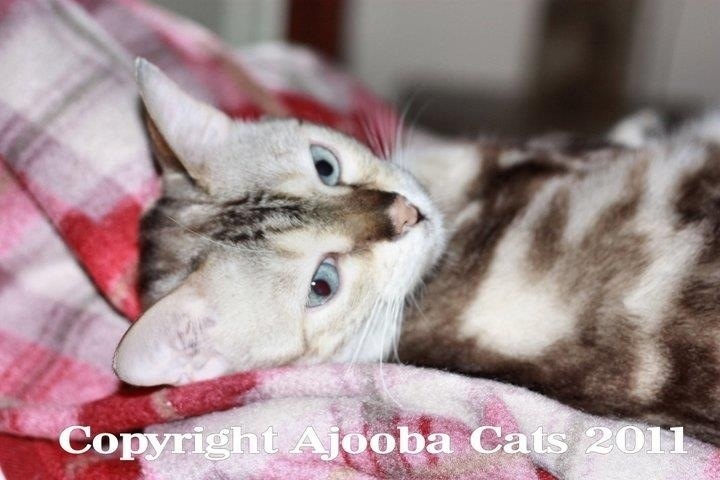 This is our dear Blizzie, a snow marbled Bengal who gave us very naughty kittens and doesn’t like other cats so lives in our bedroom for now (4years). 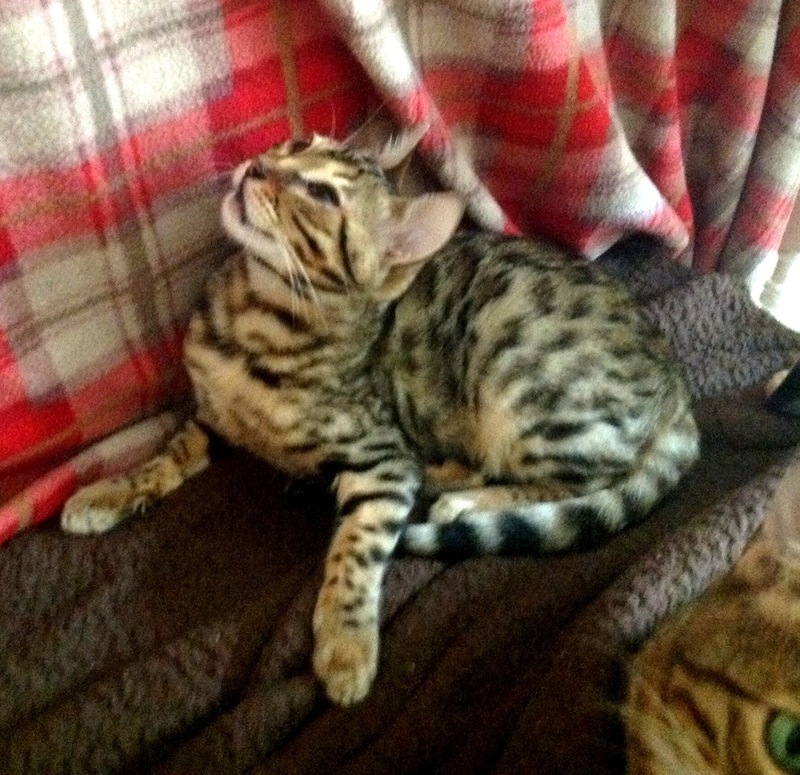 We have a few older kittens we would like to see go to good homes in 2013, this is Victor, at 4 months, one of the brown spotted rosetted kittens we’d like to see leaving us for a forever home. He is huge now! 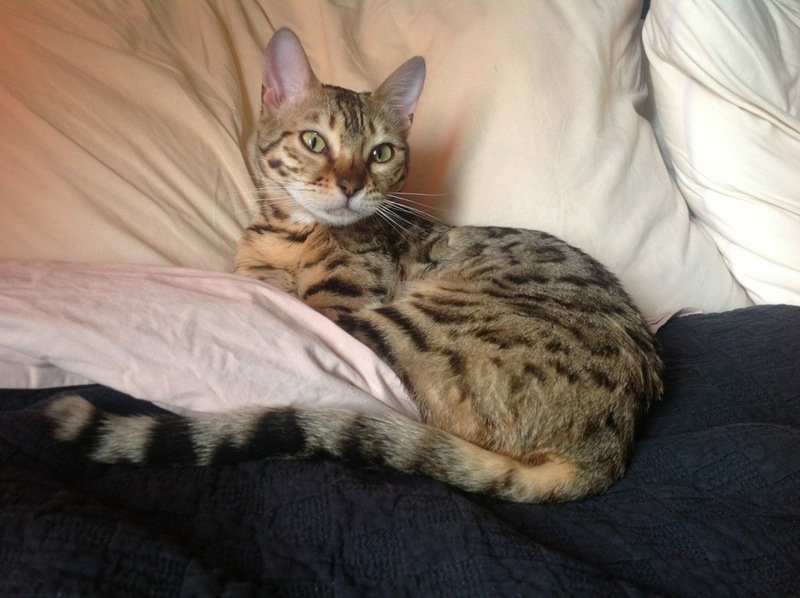 This is Victory, a brown spotted typically headstrong Bengal young adult who is a delight when she’s being good. Inquisitive and affection in equal parts this girl is exemplary of what a bengal should be. Victory is also one of the kittens we have raised on a purely raw diet. She has never had an upset tummy and enjoys her raw food daily. I will write about the many highs of having these beautiful cats in our lives and share more about them over the coming year. I love your cats. We so nearly had a Bengal many years ago, before they became ‘popular’.In the end we opted for a blue Burmese. 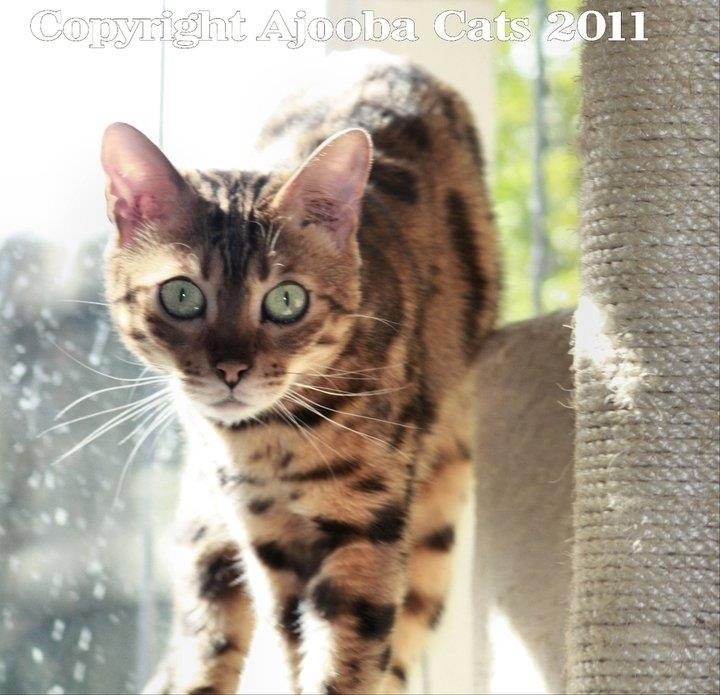 He was a little devil but a truly loving boy..
Bengals are naughty and headstrong but very loving and entertaining. Thank you Geoffrey. They are very interactive and bright. We have to tie our kitchen door shut and the bathroom can only be accessed with a pen knife. They play fetch and are amazing acrobats! Love your furbabies!!! So precious and beautiful. They all look so pampered and happy! Did you really say 17 cats! Oh my. Yes, but we do have out door housing for them too. Your cats are gorgeous. I had a cat as a young girl and then again when our son was little but Coco passed away several years ago. I was thinking of adding a cat to our home again but we have a dog — a feisty hound who loves nothing more than to pretend bite and play. Do you think a cat would be able to tolerate him? I fall in love with animals quickly. I would hate to get one and then, unable to let it go, have to keep them apart. In any case, great pictures and great blog! There are many Bengals sharing a home with a dog and when I did breed them I did home them in homes where there were dogs and not had any issue. In fact, I think Bengals prefer sharing homes with dogs rather than other cats. Of course every dog and cat is an individual but I would seek a good breeder in your area who is open to helping you home a Bengal with your dog. Every bengal is different and some of ours are very laid back, they’d be like any other domestic cat if they didn’t live with the few naughty and devious ones we have, but its definitely interesting and fun. They are so gorgeous, Tinky in particular! Thank you, Tinky rules the roost. Definitely, ours are in charge of everything, it feels like we are allowed to live with them rather than the other way round, but I wouldn’t have it any other way. Early generation Bengals are rarer and more expensive now as the breed has been around for over 30 years now. The earliest we have owned was an F4. Wow! Sounds adventurous, and like a lot of work! WOw! They are soo cute looks like mini cheetas! Me too, I’m hoping to rescue a dog someday too. What gorgeous cats. We’ve got a manx named Bee, and two moggies named Shadow and Chloe that the children left with us 🙂 They all have long black fur they shed everywhere, and we have a honey coloured carpet! Thank you, we gave up on carpet a while back. Bengals are beautiful. I think Rosie and Victor look very sweet! Thank you, Victor is our biggest Bengal here and is a complete softy. Rosie remains one of the most headstrong cats I’ve ever known. I’m happy you write about them. I’m delving into some of your other topics, too. You have helpful and important things to share, and I, for one, am benefitting greatly from your writing. Thank you. Thank you for reading. You’re very kind. Sadly I’m allergic but if I could have a cat I would want a beautiful Bengal like one of yours. My husband’s allergic. I keep medication for him. If we didn’t have the Bengals I would have seriously considered a Sphinx or two. A Thai couple who live in the next block have a very headstrong Bengal. They are forever wandering the streets calling for him to get him to come home. We’ve met him roaming around a few times. He fights dogs. Completely fearless. We have never let any of ours out, more for the same of other pets in the neighbourhood. They really are the hooligans of the animal world. This one has a go at our dog (about eight times bigger and heavier) every time we pass him swaggering down the street. They are such little show offs, once they have intimidated another animal. I love my cats, but in retrospect if I was to do it all again I would rescue. I can understand that. When our towns and cities are crawling with unhappy, unwanted, homeless animals it seems obtuse to breed even more of them. I know, most of them go to good homes, but if the ‘good homes’ were happy with a black and white spotty or a stripy brown cat, there would be less misery. Exactly. There’s always a need for foster homes and permanent homes and I’m not really that fussed what a cat looks like, I love them all really. I don’t think I’ve come across a cat I didn’t like. Thank you, they’ve trained us well.